On Thursday 16th November 2017 over a hundred members of Solihull’s different faiths communities gathered at The Church of Jesus Christ of Latter-day Saints on Hampton Lane to enjoy an hour and half of music, words, song and dance. Some items in the varied programme were sacred, others not, but all were reflective of the diverse cultures and traditions of our various faiths. 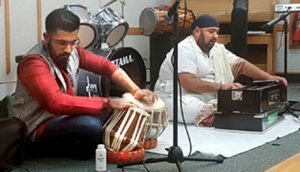 Instruments less familiar to some but much used in worshipping communities, such as the tabla, a pair of drums, and the dilruba, a stringed instrument which shares some of the characteristics of the sitar, both from the Indian sub-continent, were used for recitals. The programme intermixed traditional dances from India and Tonga with songs from China, a movement from a Mozart Horn Concerto, a Sikh ‘Boy Band’ and a very moving rendition of ‘Oh My Lord’, an Islamic Nasheed variant of Leonard Cohen’s tune ‘Halleluhah’. In concluding the evening, special guest, the Mayor of Solihull, Councillor Stuart Davis expressed his appreciation and underlined the importance of celebrating the diversity of faith in the borough before members of audience got to know each other better over light refreshments. At our meeting last week, the various faith representatives at the Solihull Faiths Forum united with our thoughts and prayers for those killed or injured in the terrorist atrocity at Manchester Arena. Led by our Muslim colleagues, we condemned this cowardly act and affirmed that neither Islam nor any other religion provides any justification for the taking of life in its name. We stand together in opposing an ideology that promotes an attack on the lives of (defenceless people), young and old. We also stand against any inclination towards retribution against any community in whose name terrorist actions are falsely claimed. We continue our work to build bridges and positive relationships between the various faith communities in our own borough and encourage others to join us. The Solihull Faiths Forum echoes the statements issued this week by the various faiths that are represented at our Forum, condemning the atrocities in Westminster on Wednesday 22nd March. Terrorism is profoundly at odds with the values of our faith traditions and the values at the heart of British society. We deplore and condemn it. All of our faiths exalt the sanctity of life and there is no justification for such a barbaric assault on innocent people in the name of religion – indeed it is the complete opposite of what we believe. We must not allow the harmonious co- existence of diverse faiths and cultures in British society to be undermined by hate-filled terrorists who do not represent any religion. We must stand together against those who would spread fear and hatred within our communities. We all offer our prayers for those injured and the families of the bereaved, commend the response of the police and emergency services and call for solidarity and unity in the face of this attack upon democracy in the UK. During this week of harmony, Solihull Faiths Forum has declared its support for the development of strong relationships between the many people of different faiths and beliefs in the borough of Solihull. We feel it is important to recognise and celebrate both the values that are shared across religious traditions and the mutual principles which form a common ground to unite us in our rich diversity. “The Faiths Forum re-confirmed its intention to encourage people of different faiths in Solihull to live peacefully together, to develop mutual understanding and goodwill, and to build peaceful, tolerant and harmonious multi-cultural communities in the borough. On Thursday 17th November 2016, the Forum celebrated Inter Faith Week in the UK by staging a celebration event, with different faiths communities in Solihull showcasing their talent in music and words, sacred and secular, as well as sharing over finger food and conversation. 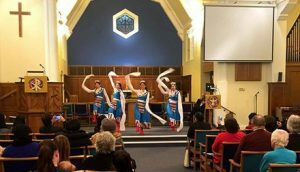 Thirteen various musical, dance and meditational items, were presented to a multi-ethnic audience of over a hundred at Solihull Methodist Church. 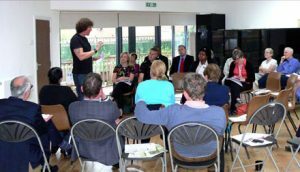 On Tuesday 28 June 2016, our Annual Gene ral Meeting gave an opportunity, after the formal business to look at the topic of ‘Faith and Social Action’. We heard from Rev Neil Roberts, Minister of Chelmsley Wood Baptist Church, about the transition of the church building into the Three Trees Community Centre (where the meeting was held) and the wide spectrum of community activity and support work being undertaken there. This was followed by a more general discussion about the opportunities for faith communities to channel energies into social action and community benefit.